I literally fell out of my chair laughing when I read that. Bravo! Methinks you deserve much credit for creating this site and its contents – not only for the intellectual challenge you’ve met but also the “public service” aspect of enlightening the average citizen regarding the law – and doing so in an entertaining, captivating manner. Thanks! I’m not sure this is entirely true. For a police officer going over the line by accident, this fits very well. However, when the police do go over the line on purpose, that is often going to be because they feel strongly about the case (or about punishing the defendant) and want to ensure a conviction. They have become personally invested beyond their job. Evidence that they do this can be seen from the cops complaining to a prosecutor who dismisses a case. This mechanic, when working properly, removes the incentive towards abuse, and can even form a disincentive in those cases where a less zealous investigation may still have turned up some of the evidence later on. In most cases, the cop has little personal investment in whether the defendant winds up being convicted six months or a year later. In fact, many (if not most) feel that their job is done once they’ve made the arrest, and aren’t all that thrilled to have to go to court later on to testify about it. That said, there were indeed times when I was a prosecutor when I’d decline to charge someone (usually because the evidence was insufficient, but occasionally because the search was bad), and I’d have to sit through a stream of invective from a very emotional, pissed off cop. But such instances are rare. Most of the time, the reaction would be more like “meh, no big deal, we’ll get him next time.” So the deterrent effect you mention really only applies to a small number of situations where the Fourth Amendment comes into play. You are right, however, in pointing out that it encourages cops who WANT to do things right, to take precautions not to cross the line. But that’s not really deterrence, because those cops really don’t want to cross the line anyway. they shouldnt have any investment anyway. people, as a matter of nature, tend to get personally invested in things they undertake, particularly if they feel they are “correct”. but that’s one way you can tell a “professional” (in sense of professionalism) cop from unprofessional; professional being not getting too personally invested. The “Deterrence” to Cops, for trampling rights, would be a civil suit in equity against their person, would it not? I’m not much versed in Tort, so, I can’t really say for certain. I love the fact that you balance neutral depictions of the law with frank critiques of its flaws. In doing this, you’re not just teaching us what the law does right, but what it does wrong. Keep up the good work! I disagree. Exclusion shapes office (and therefore officer) procedure! That’s why police officers will often wait and call in for emergency warrants rather than busting in and taking a chance. I’d say that’s deterrence! You’re never going to deter everyone, though. So it serves BOTH the purpose of deterrence, and as an appropriate legal remedy. Right? Procedures are just rules for following the rules. That’s not the same as deterring someone who otherwise would have broken the rules, is it? It’s not the same in the moral sense. We’d like our police to refuse to perform unreasonable searches because they’ve studied and internalized the values of the 4th amendment (in the same way we have). But it’s the same in the practical sense. Whether the cop thinks back to the Federalist papers, or just the fact that her lieutenant is going to chew her out for not following procedure, a bad search doesn’t happen. Of course, if the cop doesn’t care about constitutional rights or office procedure, yeah, you’re kind of screwed. 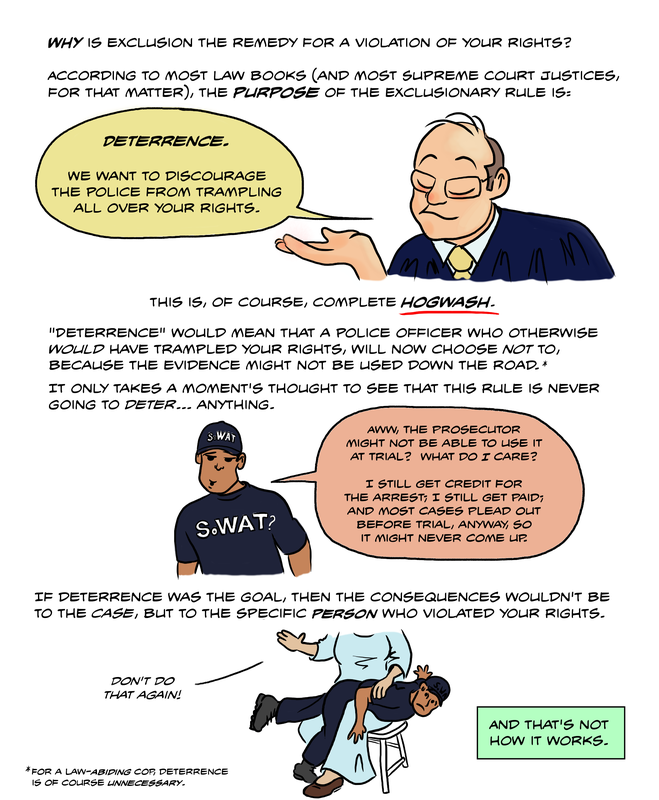 Technically, the word being sought here is not “deterrence” but “disincentivising.” Rather than actually giving the cops a reason not to do something, we’re taking away a reason to do it. Why go through all that trouble storming into somebody’s house unlawfully, when it’s not going to matter for the case? The police are still professionals, and professionals are surprisingly often motivated primarily by a desire simply to do what they do and do it well, and to take pride in their work, more than by the financial or other incentives that get thrown at them. Tell them their effort won’t matter, and they will, at least sometimes, not care enough to try. Couple that with the fact that you can’t gather evidence twice, but you can gather it in several possible ways, and you’ll see that gathering it through improper procedures might foil an attempt to gather it lawfully later. I get that police may not seem to care what happens after the arrest, but if they didn’t have the classic professional motivation, you’d see some cops who literally just come in with a stack of 20 arrests every day, none of them even remotely solid (never wait for a warrant, etc). A case that turns into a conviction is still more desirable, even for the “bad” cops. Much weaker than it would be if you actually punished the cops, of course, but that’s the mechanic we’re looking at. Is that Rhenquist in the first panel?